Ancient Stones - Lothian - 043 Stone, Aberlady Bay, Aberlady. This large recumbent stone caught my eye one Sunday evening when returning from North Berwick. 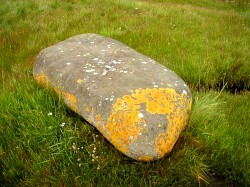 It lies on the foreshore just a few metres west of Aberlady village and measures 2.35m long x 1.20m wide x 0.75m thick. The stone is well rounded, most likely by the tides, as it presently lies between high and low tide marks. One end is pointed and the stone is of a type local to the area. There is no known prehistoric associations with this stone and whether it stood upright is unlikely ever to be known, unless time travel is developed. I'm working on that! Aberlady is on the east coastal road (A198) out of Edinburgh. The village can also be reached by following the A6137 from Haddington, just off the main A1(T). There is a small parking are at the entrance to Aberlady Bay nature Reserve, about 500m to the west. Vehicles may also be parked in Aberlady but please do not block access to private gates and driveways. Sorry but no folklore or other traditions have been found associated with this stone, although it is possible some local, but as yet unknown, associations or traditions may exist in the Aberlady area. Although this site does not appear to have any connection whatsoever with prehistoric times, it does stand out when you drive along the shore road between North Berwick and Aberlady, at least when the vegetation is low. The stone is an obvious fallen standing stone shape and the shape does not match that of the few other large boulders in the area. It could be pointed out that the stone lies within the tidal range of the bay but this might not have always been the case, as the coastal scenery may have been vastly different 2000 or 3000 years ago. One possibility is that the stone is a fallen boundary stone, relating to the local town or parish.